While slow cooking is avoided because of the lengthy time duration involved, there are professionals who recommend this cooking method over others for all good reasons. Chef Kunal Arolkar who runs a bakery shop says, “Slow cooking not only enriches the taste of the dish but also adds on to the colour because of the mild flame.” There are many conventional dishes that if cooked in a slow method can actually taste divine. Here’s a list of 11 dishes that are totally worth a try. Have you ever tried the slow-cooked Hot Cocoa? If not, give it a try for the perfect liquid chocolate taste. The slow cooking process allows the cocoa powder, milk and sweetener to simmer together seamlessly. Well, omelette on a slow cooker might sound like a disaster, but, is actually a genius idea. Pouring the mixture into a slow cooker, and cooking for almost an hour can help you get a fluffy omelette. Generally baked or smoked, meatloaf is a simple and healthy dish. If you find it difficult to handle the oven heat, then try cooking it by using the slow cooking method. This dish tastes amazing, when prepared in a cooker. Try it and thank us later. For every foodie, cooking mac and cheese in a slow cooker will be no less than a bizarre thought. But, let us tell you that this process of cooking keeps the nutrients intact and also makes the dish fluffy and cheesy. 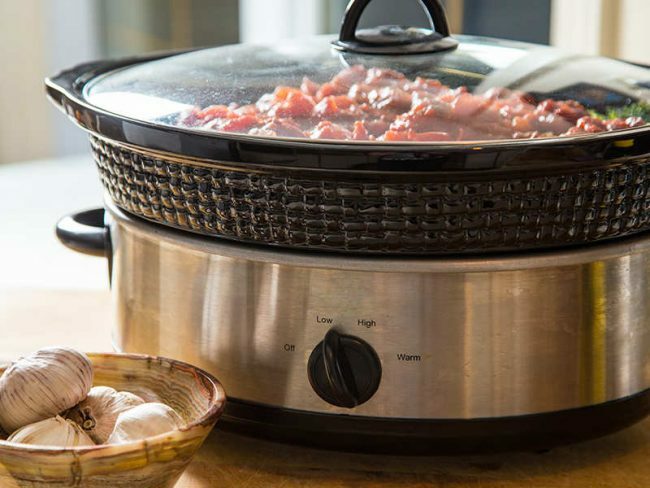 For a change, say no to readymade yogurt and try the homemade variation in a slow cooker. Scald the milk to around 115-110 degrees (use a kitchen thermometer) to check the temperature and make your own yogurt by heating the milk in a cooker. There’s nothing like homemade yogurt. Baked potatoes are dry and at times end up with as raw spuds. The easiest solution to have the perfectly tender ones is to slow cook them with your favourite toppings using a cooker. It is always better to prick the potatoes with a fork and then start cooking. If oven cooked food sounds healthy, but seems like a daunting task. Then you can try preparing the French Toast Casserole in a slow cooker. The best part is slow cooking retains the flavours and accentuates the taste. Crumbles made in a slow cooker can actually help you avoid adding extra sugar to the dish. All you need to do is to layer the ingredients directly into the pot and let the cooking process work. To avoid a soggy crust or a cracked top, make your favourite cheesecake in a slow cooker for the perfect taste and texture. If you are struggling to prepare the perfect brownies at home, then replace the cooking process from oven to a slow cooker. They taste much better in terms of taste and texture, when prepared using the slow cooking method. Try making your own homemade bread through slow cooking process and trust us, you will stop preferring packaged slices. Also, bread-making procedure using the slow cooking process is less time consuming as compared to other methods.